It took me a while to get the size of the mints just right. The recipe reminded me of making taffy: bringing sugar, water, and butter to a boil, adding the flavoring, and pulling the cooled mixture with your hands. I participated in a taffy pull in high school. All I remember is a syrupy mess, a chaotic kitchen and an extraordinarily sticky floor. I wasn’t too keen on reliving that experience, so I did a Google search for the Taste of Home recipe and found this — apparently, LOTS of people had problems with this recipe. “I tried this recipe twice and both times it failed to produce what the recipe claimed.” “All I was able to make was mint sugar.” “I as well followed the directions specifically and am not sure what would be missing from this recipe or wrong because as it stands, it doesn’t work.” Etc., etc., etc. Instead, I tried this recipe and, although it appeared to turn out better than the other recipe, I still had problems. For the life of me, I can’t imagine how the mixture could be cut into shapes; the “dough” isn’t sturdy enough. You can, however, take small amounts of the mixture and, with well buttered hands, roll it into small balls. I prefer to roll the mints in a powdered sugar as well. The recipe below is adapted from the original. As for the taste, it’s good: sweet, minty, and rich. The only problem is that I have trouble getting past the idea that I’m eating (at best) pure frosting or (at worst) sweetened and flavored butter. The powdered sugar helped me think of the mints as a more of confection. In a mixing bowl, cream the butter. Gradually add sugar, cream and extracts; beat on medium speed for 3-4 minutes. If the mixture seems a soft, add a bit more confectioners’ sugar. Add food coloring and mix to combine. Line a cookie sheet with parchment paper and butter your hands well. 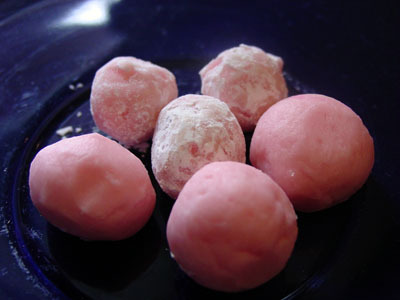 Form mixture into small balls, rolling in additional powdered sugar if desired. Place the ball on the cookie sheet and repeat the process. Chill the mints for at least two hours before serving.